Few people see their gardens as dangerous places but it’s a sad fact that thousands of people are injured in UK gardens every year. Most of these accidents could be avoided if garden owners carried out a simple risk assessment exercise. Go around your garden and see how many potential hazards you can identify. Once you’ve noticed a problem it’s usually easy to find a way to solve it. Trips and falls are the most common types of accidents and can result in cuts, bruises, broken bones – or worse. 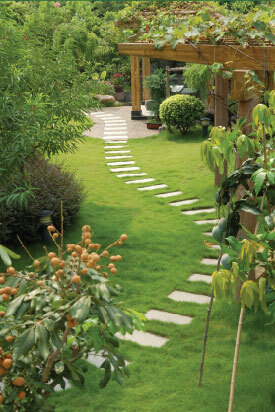 Check garden paths for uneven or slippery surfaces, loose slabs and crumbling edges. You might be used to a path that’s more like an obstacle course but it could catch out an unwary visitor, or even you if you’re in a hurry! A firm, non-slip surface is even more important for garden steps, and they can be made safer by adding a sturdy handrail. If your garden is on different levels linked by steep steps could they be redesigned to provide shallower steps? Never leave garden tools lying around when you’re not using them. Someone could trip over them or children might decide to play with them. If you need several tools for a particular job keep those you are not using grouped together where they’re easily visible. Never, ever, lay down a rake with the tines facing upwards. When you’re not gardening, all tools should be securely locked away. Permanent electric-powered features, such as garden lighting and water pumps, must be installed by a qualified electrician who can certify their safety. Never be tempted to do-it-yourself using cables designed only for indoor use. Don’t operate electric lawnmowers, power tools, or other electrical equipment in wet conditions, and make sure the sockets you use are protected by residual current devices (RCDs) that will instantly switch off the power if a fault occurs. Don’t use long extension leads trailing from inside the house. They can easily become tangled or trip someone up. Instead, ask an electrician to fit a weatherproof socket in a convenient place on the outside of the house. Many of the most toxic weedkillers and pesticides have been banned in the UK so if you have any old garden chemicals lurking at the back of your shed check with your local authority to find the nearest household waste site where they can be disposed of safely. Modern weedkillers, pesticides, fungicides and plant foods – including organic ones – should only be used following the manufacturer’s instructions and kept out of reach of children and pets. Other chemical products such as cleaning fluids, paint, lubricating oils and wood preservatives all have their uses in the garden, but never forget they are also poisonous and treat them with care. A pond can be a wonderful addition to a garden and a magnet for wildlife, but the smallest pool can also be a great source of danger to young children. If you have children or grandchildren and an existing pond, either fence it off so they can’t reach it or fill it in until they are older. If you want a water feature, choose a fountain type that provides the sight and sound of water without the danger of a pool. Safety is an important factor that should be taken into consideration when designing any garden. If you’re concerned about any aspect of garden safety ask the advice of an experienced landscape gardener who will be able to suggest alterations that won’t look out of place but will give you peace of mind.